This story originally appeared in the December 2002 issue of Realms of Fantasy. The illustration is by Kyle Anderson and Mia Lee. Learn more about the story here. The first time he kissed her was in a dark, dusty corner of the kitchen, behind a great clay oven. The second time was on the stairs in the high north tower. Through tall window slits they could see patches of yellow and orange field broken by winding river, stretching below them. The third time was in the courtyard, his back pressed tight against the stone well, while down in the darkness an old wooden bucket, hanging by a chain, swung back and forth, hitting against the sides, knock-knock. Galan was in love with her. Her name was Sarei. The Lady Sarei. Her face was young and bright, her hair straight and black. She lived with her seven older brothers in a dark fortress at the edge of the world. 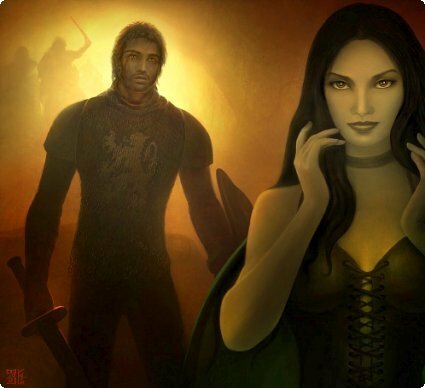 Galan followed her gaze, back to the keep. “Yes,” he said, drawing away, reluctantly. He hurried across the yard. The fortress was cold and foreboding. Creeping vines grew out of the grime between the blue-black stones, and clusters of crows perched at odd angles along the rocky battlements. He passed below them, through a high arch. In the great hall, Sarei’s brothers sat together in the light of the hearth. Across the table from them sat Galan’s own company, ten rowdy young men. He joined them on the bench. Balthus was the oldest brother, and Douglas was the loudest, but they all looked the same — pale skin and black hair, except the twins, who were blond. Vassals, they were obligated to grant hospitality to knights, but they didn’t like it. It had been a week, and they wanted their guests gone. But leaving here would mean leaving Sarei. Galan noticed the brother named Douglas watching him. “You’ve never told me,” said Douglas, stroking his long mustache. “Who’s the best soldier in this bold company?” There was a mocking edge to his voice. And I train constantly, he thought, with sword and lance and quarterstaff. I train until the master-at-arms retires bruised and weeping, and my practice sword shatters against its target, and the blood runs red down my wrist from a dozen cracked, dark blisters. I train through the night while the white stars wheel, until the rooster crows at the light. Because I dream of a lady to rescue. A lady to fall against my chest and whisper: My brave knight, my love. A lady like Sarei. He glanced at her there on the stairs. Her eldest brother, Balthus, noticed his gaze and turned to look. Sarei fled up the steps. Some of the brothers snickered. After supper, he met Sarei out behind the stables. The horses stamped and snorted. Clumps of wet straw spilled from the bales and across the dirt. He wondered how fast they could follow, and how well they could fight, and how badly they would want her back. She was their sister, after all, and there were seven of them. Seven against one. He stared at her, at her flushed cheeks and desperate eyes. She needed to be rescued from all this, he knew. And what was it for, the hard hours with sword and lance, the daydreams, the sad longings, if not for this? They went about the fortress, gathering belongings, then stole back to the stables. Sarei’s mount was a milk-white steed, and his a dapple-grey. They rode off into the night. The morning sun shone bright across the dewed, yellow grass. Galan and Sarei splashed across a rocky stream, then rode up toward a line of trees on the far bank. The sky was huge and pale blue above them. It echoed the sound of hoofbeats. They paused at the edge of the forest, to look back. A rider on a white and brown horse came over the hill behind them. Galan and Sarei spurred their mounts and fled through the trees, trampling the undergrowth. In a great gold meadow ringed with oaks, Galan wheeled his horse. “Go ahead,” he shouted. “I’ll meet you.” Sarei’s eyes were wide with concern, but she rode on. Galan tossed back his cloak and drew his sword. Sunlight shone through the green branches all around, dappling the trunks of trees. To be alive, he thought, in the forest, in love, with a sword in your hand, and a foe to face. His horse took an anxious step back as Balthus burst into the clearing. “Villain!” Balthus reined his steed. “Kidnapper!” His shoulders were wide, his jaw broad, his eyes dark. Balthus surged forward, sword held high. He beat at Galan’s head with overhand blows. Galan parried. The horses passed and circled, snorting, misty breath glistening in the morning air. Balthus backed away, then charged again, and Galan scampered aside. Their swords met, clanking in unsteady rhythm as the mounts swayed. Galan slashed. Balthus pulled warily out of range, hesitated a moment, then attacked again. Galan met the man’s sword and swept it aside, as their mounts stumbled close. The men were almost eye to eye. Then Galan smashed the pommel of his sword into Balthus’s face. The man dropped from the saddle and hit the ground hard. His horse turned, wary and confused, and Balthus gasped and held up his arms as one of its hooves came down, crushing his head. Galan glanced back towards the forest. Sarei sat on her white steed, just inside the trees, watching. That was the last thing he wanted. Balthus’s horse trotted away, leaving a line of bloody prints in the wake of its red hooves. He thought she might blame him, be angry and yell, or else fall weeping into his arms. She didn’t. She simply sat there, still and silent, staring raptly at the lumpy mess that had once been a brother. They rode away. Black-winged crows dropped out of the branches all around, settling lightly over the body, like autumn leaves. They followed a winding path through stony fields. Boulders loomed overhead, green with lichen. At noon they crested a hill. Below, the Briars began, stretching to the horizon — looping branches thick as a man’s arm, high as a castle wall, with wicked thorns. Galan and Sarei were halfway down the hill when they heard hoofbeats. But again she hung back. “It’s Sebal,” she said, when she saw the rider. The man was slender, with short-cropped hair, and his face was gaunt but handsome. Galan met him. They fought among the boulders, swords ringing. Sebal tired quickly. He wheeled, to put some distance between them, but Galan pursued, forcing him back toward a boulder that jutted sharply out. Sebal parried blow after blow, just in time to keep Galan’s blade away from his knee, his shoulder, his throat. Then Galan reared his horse, and it leapt up, roaring, hooves wheeling in the air. Sebal bolted. As the boulder’s shadow fell across his face, he turned, just in time to see it smash into his cheek. He fell amid the rocks, neck broken. Her smile fell away. “He was wicked. He deserved to die, for what he did to me.” Angrily, she spurred her horse and rode off ahead of him. Galan caught her quickly. “I’m sorry,” he said, riding alongside her. Branches arched above, blotting out the sky. In some places the thorns pressed tight all around, and Galan and Sarei crouched and covered their faces, pulling the horses behind them through the fog. And there were roses. Soft, white roses grew up and down the vines. The dirt was spotted with their petals. Galan heard twigs snap, from near or far, it was hard to tell. Nearby branches were vague and ghostly, and everything beyond that was shrouded in white. He kept his sword in his hand. They came to a spot where the vines were thick as tree trunks, the thorns long as daggers. As Galan bent to rest, someone ran out from behind one thick stalk and slashed at him with a giant sword. Galan parried, but the blow sent him reeling back, arms quivering. The brother was young and fierce. He carried a two-handed sword and swung it like a hammer. Galan blocked, teeth ringing. He blocked again. And once more. His sword cracked, its blade tumbling to the ground. Galan hurled the hilt at Jait’s eye. The boy turned aside and the broken sword spun harmlessly over his shoulder. Galan fled. Jait followed, hacking back and forth with his enormous sword. Galan crouched low and scrambled through the branches as vines and thorns fell away behind him. Then he spun, his back pressed against a thick stalk, and watched as the great sword came hurtling toward his neck. He dropped. The blade buried itself six inches into the wood above his head. Jait tugged at the handle, violently, but the sword was lodged. Galan leapt forward, seizing the boy by the shirtfront and running him back against the brambles. A giant thorn burst black and oozing through Jait’s chest. Galan gasped and fell away, and the boy hung there, impaled through the heart on one great thorn. The vines drank him greedily. His blood leeched through the stems into the white roses that hung all around, and near his corpse their petals became dark crimson, and farther away they turned bright scarlet. Sarei said, “Look at it. It’s beautiful.” She plucked a rose from near her dead brother’s elbow. Galan made his way over to the place where Jait’s sword hung, buried in the wood. He set his foot against the stalk and ripped the heavy weapon free. “Can you fight with that thing?” Sarei asked. “I can fight with anything,” he said. She smiled. That night, as they lay on his cloak against the hard ground, Sarei slipped out of her dress. She tore at his belt, and climbed on top of him. As she swayed there, lowering herself down onto him, then up, then down again, she threw back her head and screamed. And when she looked at him, her eyes were aflame with lust and desire, with terrible pleasure. Like when she watched her brothers die. Galan had doubts. He had dreamt of a lady who would love his courage, but hate bloodshed. She might weep when men died, but he could be strong for her, take her into his arms and comfort her. Sarei did not weep. Would it be better if she did? he asked himself angrily. Would that be better? Yes, a voice inside him replied. Better if she wept. Better if she bore it in brave silence. Better even if she hated him for it, shouted and hit him. Anything would be better than this — to see her laugh at the murder, to see her eyes light with joy at each revenge — on her own brothers. It was wrong, no matter what they’d done to deserve it. The earth turned soft and muddy along the bank of a slow, brown river. Galan and Sarei beat a path along the shore, looking for a place to cross. Instead they found Douglas, kneeling by the water. His horse plodded through the shallows, lapping at the river. Douglas attacked. Galan fought cautiously, adjusting to the heft of his new weapon, feeling out the man’s strengths. After several minutes, Galan knew he was better. Then he attacked, pushing forward with fierce, clean strokes, driving Douglas back into the river. The muddy water splashed about the man’s ankles as he withdrew. Galan rushed in, and the water seeped through his boots, squishing between his toes. He had the advantage now. Douglas was in up to his knees, struggling to move his feet. As Galan shuffled forward, his toe smacked into something underwater, and he almost lost his balance. A loop of tree root, it felt like. Douglas, too busy defending, didn’t notice. Galan retreated then, maneuvering the root between them. When Douglas advanced, his feet snagged beneath the water and he tumbled down, splashing into the river. His sword spun away, lost in the slow current. He rolled onto his back, sputtering, but Galan was already there, pressing the tip of the greatsword into the man’s throat. “Fine!” Fury overtook Galan. He raised his sword. “My brothers will avenge me,” Douglas said, then the blade came down, pushing him under. The river swallowed his face. Clouds of dirt and blood billowed up. When Galan yanked his sword away, the body began to drift downstream. Galan’s voice was hoarse. “What did he do to you?” He didn’t want to upset her, but he had to know. “A notorious … ” Galan struggled for words. “Well, a lecher.” Any man would chase Jamie away from a young sister. Galan watched the sky. Through the enclosing brambles, the bright clouds seemed far away, and free. And he was with Sarei. They had crossed almost to the far side of the Briars. Beyond were open fields. Galan was struck by a wild impulse to bolt at the first sight of unbroken grass, to gallop away, leaving Sarei and her damned brothers far behind. Or maybe, he thought sourly, he could just take her back. But it was impossible, all of it. What would people say? Galan the knight had taken a young girl from her home, spent a night with her in the forest, killed four of her brothers — maybe more, if his rotten luck held — and then deserted her. He would be dishonored forever. He clenched his fists and rubbed his temples hard. There was nothing to do but go through with it, take her home and marry her. He hoped they would encounter no more brothers. It sounded grim, but Galan had defeated them all so far. The air turned cold, and snow fell. Flakes drifted down and clung to the tips of thorns. Galan could see out beyond the brambles now, and the dry grasses were tinged with white. A coal-colored wisp of smoke, from a cook fire, smeared the gray clouds, but there was nowhere else to go except back into the Briars, so he pushed forward. Aron and Adom had camped at the top of a low hill. They came down a winding dirt trail, swords drawn. Snow was sprinkled through their blond hair. “I don’t want to fight you,” Galan told them. They watched him with two identical faces, two identical angry faces. They exchanged a glance, nodded, then advanced. Galan expected them to split up and attack from different directions, but they didn’t. They stood shoulder-to-shoulder and came at him with jerking thrusts. He retreated, parrying in wide horizontal sweeps, knocking aside the tips of their swords. They were not very skilled. But there were two of them, and they did spread apart, finally, and then one got the idea to circle around behind him. Galan swung his body back and forth, slapping aside attacks first in front, then behind, now in front again. The twins closed in, pressing him. Then they rushed, by chance at the same moment. One raised his sword above his head and the other lunged. Galan spun away as one man skewered his brother through the gut. The twins watched each other, like a man studying himself in the mirror. The dying one sank away, exhaling frost, sliding off the end of his brother’s sword. Then Galan swept forward and battered the other with heavy strokes. The man tumbled to the ground, his two pale wrists falling across an ice-crusted log. Galan brought his sword hurtling down, and the hands fell away. There was blood on the snow. Galan lifted his weapon to strike again. Galan jammed the sword into the snow. Stuck in the earth like that, its hilt came almost to her shoulders. He gestured at it. “Then let’s go,” Galan said, turning away. “Fine.” Sarei’s face was set in a stubborn scowl. And as Galan watched, she ripped the sword free, set her feet apart in the snow, and started hacking at her brother’s face. This was unreasoning. Bloodthirsty. Like I was? he wondered. Before I saw it in her? Sarei was happy while he was helping her, but with her brothers gone? Where would her anger turn? Galan didn’t know whether to laugh or cry. They rode on unhurried. They were home free now. But he would never be free, of her. Unless he was defeated by Whit. Galan smiled, in spite of himself. If Whit were victorious, and took Sarei home, there would be no dishonor in that. Galan had won six straight battles for his lady, no one could fault him for failing the last. He would lose glory, certainly. But glory could be won back later, on the battlefield. It would be possible, if Whit was inept. Give him an opening, take a weak blow to the shoulder, pretend to be wounded, stumble off into the trees, let him grab Sarei. And lose to a younger boy who could barely wield a sword. The thought made Galan grit his teeth. But it was the only way. They saw Whit’s horse the next afternoon, in the valley behind them, just a black dot. It had taken the boy forever to catch them. The other brothers must have ridden off and left him days ago. “Are you going to face him?” Sarei prodded. “If I have to.” Galan didn’t want to seem too eager. A sudden change might make her suspicious, but he did ride more slowly, and delayed at every opportunity. They spotted Whit again and again, across wide fields, trailing, but never gaining. By the fourth day, Galan was impatient. They had slowed practically to a walk, and still Whit did not gain. And never would, Galan realized. Whit had no intention of catching them, of dying like his brothers. He would return home defeated, claiming truthfully that he had pursued Galan over many leagues, but had not overtaken him. Galan could just picture him — trotting back there, slouched in the saddle, hanging his pale, chubby head, telling himself that he was doing all he could, under the circumstances. On the fifth night, by the light of the fire, Galan told Sarei, “I’m going to go back and face him. He’s getting closer.” That wasn’t true. “He might sneak up in the night.” Galan was more worried about him sneaking off in the night. “Yes,” Sarei said, and her eyes glittered at the suggestion of a brother’s death. In the morning Galan circled around. Snow melted and ran glistening off the leaves. Sunlight shone beyond the clouds, and Galan, for a moment, felt hope. When Whit attacked, his sword swung in lazy circles, like a flower in the wind. Galan parried the first of these casually, but quickly decided to slow his strokes, to seem more off-guard. After long minutes of fencing, it was time. He dropped his elbow and kept it low, creating an easy opening to his shoulder. Whit didn’t take it. They fought on. Galan lowered his guard even more, but Whit just kept slashing away at Galan’s knees. Did the boy think it was a trick? But no, Whit was just oblivious to the opening, to any opening. That made things difficult. If Galan couldn’t anticipate the attack, it would be hard to roll with it. And Whit’s attacks were unpredictable. Most would miss even if Galan stood still. Catching a glancing blow would not be easy. Finally, Galan saw his chance. He leapt forward, pretending to stumble, and caught the tip of Whit’s sword. But the blow was stronger than he’d judged, biting deep into his shoulder. His scream was real. “He killed your brothers, Whit, and you run away? Are you so afraid? Of a wounded man?” Whit was afraid, clearly. He hesitated a long time. But Sarei’s shaming had gotten him. Like it got me, Galan remembered. Whit groaned unhappily. Then he came, picking his way through the undergrowth, cutting it away with his sword. Galan fled deeper. He pushed through a leafy tangle and emerged at the base of a sheer rock wall. He couldn’t scale it, not injured, and there was nowhere else to go. He slumped against a boulder, and stared at the white sky. He thought of dying, out here. He couldn’t let it happen. Not like this. He lay still. Through slitted lids, he watched Whit’s cautious approach. I’m dead! Galan wanted to scream. Go back and tell her. Tell her you think I’m dead. But Whit inched closer, his sword held ready. Forgive me, Galan thought. I had no choice. She gave me no choice. It’s him or me now. No choice. Whit inhaled sharply and raised his sword. Galan rolled forward, wrapping one arm around Whit’s ankles, dragging the greatsword across the back of the boy’s knees, slicing the tendons. Whit collapsed and lay thrashing, screaming into the dirt, legs spasming. Galan crawled on top of him and planted the sword through the back of Whit’s neck. It passed out the boy’s throat and stuck in the ground. Galan gasped and sobbed. He grappled with the sword, which stood anchored there, and used it to pull himself to his feet.